Something I enjoy doing with my crazy big cookbook collection is to grab a cookbook, open to a recipe and make it no matter what it is. I only redo “the grab” or open to a different page if the recipe has something my husband is allergic to (such as mushrooms) or if it’s something my husband and I simply won’t eat (like offal). Jim Fobel’s Big Flavors, 400 Taste-Intensive Recipes for Everyday Cooking and Special Occasion Entertaining is my latest “grab” off the shelf. Jim Fobel was the test kitchen director of Food and Wine magazine from 1979 to 1983. When he published this cookbook in 1995, he was a contributing editor for Cooking Light magazine. He wrote several other cookbooks including Jim Fobel’s Old-Fashioned Baking Book that won a James Beard award. I remember 1995 very well. It was the year my husband and I had our whirlwind romance and got married. I wasn’t buying cookbooks around that time because I would be moving from Milwaukee to Memphis and the cookbooks I already owned were an issue in the move. Oh, well….love me, love my cookbooks, Honey! This iconic cookbook was one of the hottest-selling cookbooks at the time and is worth tracking down now. I found it in a used bookstore in great condition several years ago. The recipe I opened to in Big Flavors was Salade Nicoise. Although I recall seeing this classic French composed main course salad on menus all over France, I had never ordered it there so I was anxious to make it. This salad makes a real show-stopping summer lunch or light supper. It typically contains tuna, hard-cooked eggs, olives, capers, lots of vegetables such as fresh tomatoes, cucumbers, blanched green beans, boiled potatoes, radishes and fresh herbs such as basil and oregano. The salad is drizzled with a French-style vinaigrette and served cold or at room temperature with or without lettuce greens. To put my own spin on this classic, I used fingerling potatoes roasted with olive oil, salt and black pepper. Instead of tuna, I used canned smoked trout. Instead of radish, I used red onion. Add a glass of rosé and you may feel as though you made a quick trip to the South of France! Enjoy! Wow so much flavor in there! I’ve never heard of canned trout but now that’s something to look for. Thanks! This salad is absolutely stunning and I love your twists on it! I like your idea of randomly choosing a cookbook recipe and making it. Beautiful salad! I don’t actually cook from my cookbooks nearly enough. I need to do the same thing. Simply gorgeous! I love fingerling potatoes – what a great addition to this colorful, flavorful salad! What a gorgeous salad! 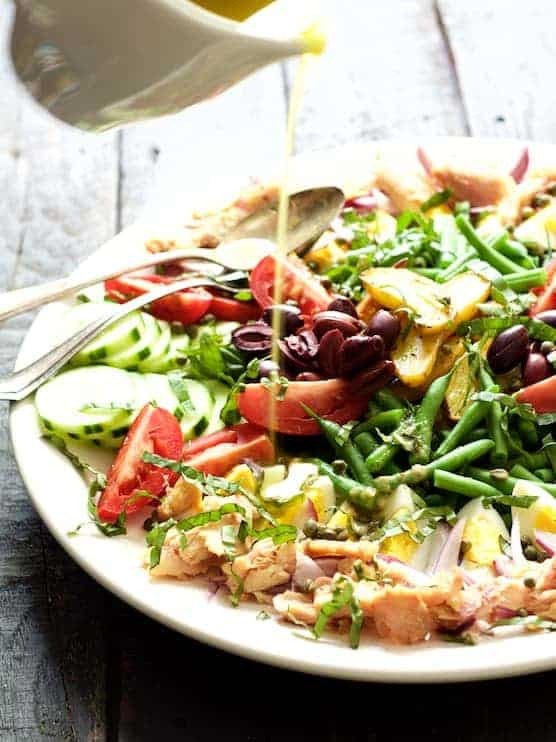 Salade Nicoise is one of my favorite summertime meals! Beautiful salad! This is a wonderful summer meal, and I love the addition of the potatoes! What a colorful, beautiful salad! Such a perfect classic dish. It looks like I need to make this asap! Another classic that is perfect for summer entertaining! 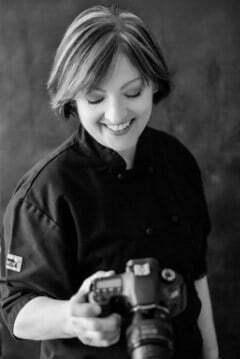 Love your twist and method of selecting recipes! 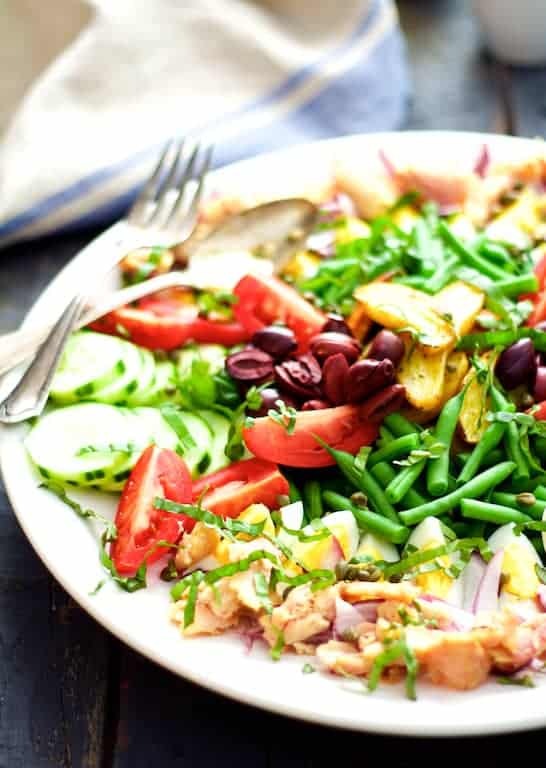 I love, love, love Nicoise salad … and your version is stunning! This is going on my “to make” list soon … it’s perfect for summer! Wow! I agree with Dorothy! Such a beautiful salad with so many flavors! Your salad is supermodel stunning! WOWSER! Thank you, Dorothy! You just made my day!!!!! !